KryptonZone Blog: European Union: a bunch of guys who can't get it up! European Union: a bunch of guys who can't get it up! Artist rendering of what "peace on earth" may look like! Seriously, I've had it. I was rudely awaken this morning - yes, it's a freaking Sunday - by a cacophony of sirens ringing in my ears. 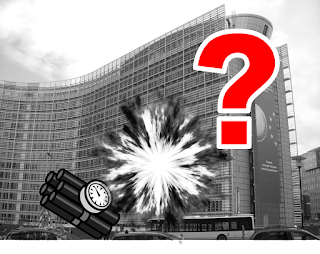 When I did wake up, I thought: "Hmm... Maybe the European Commission has been bombed or attacked, finally." Alas, no. It turned out to be a bunch of useless Eurocrats and their heads of states deciding to meet in Brussels to talk about the failing Euro. I've been living in this grey hole (aka Brussels) for the past eight years. And for the past five, I've had to pay a huge amount of my earnings in tax. I'm talking around the 45% mark, which jumped to 50-55% in January this year. As far as I can see, normally, when there is a high tax, citizens have a higher quality of life, like in Scandinavia and Switzerland. In Belgium, no... Not even close. Now those heads of state are having meetings over a Sunday because they have nothing better to do, they decided to make use of that tax money I've been putting into this country. They've mobilised the police force en masse and their flying squadrons to drone around over my head like a very large and very annoying fly, but instead of hovering over poo, they've hovering over the European Commission. Apart from my tax money being burnt up in fuel and turned into massive amounts of CO2 (yes, you bleeding hypocrites, you're emitting more Greenhouse Gasses by meeting next to my house than you've saved in the past year with your pesty laws! ), what is also happening is that I've had no say in any of this. As the Belgian government considers me a transiting resident, even though I've been here for eight years, and force me to pay exorbitant amounts in tax, I'm legally not allowed to vote. I'm not allowed to vote in local or national election, and I'm also not entitled to have a say over European matters. Does that seem fair? No, I don't think so either. Hence my furious gripe about all of this. A bunch of losers are meeting, spending a whole heap of my money, and not allowing me to have some sleep so I can work harder and earn more so I can pay more of my money for their idiotic meetings. Last line of thought... An exciting statement was just released by the spokesperson from my neighbour saying that the EU States have "mostly agreed" with the bailout blah blahs that were discussed. So, after annoying me for a whole day, they didn't even come to a conclusion?! For f£%£'s sake! Useless limp dicked twats! Occupy EU! Occupy EU! Occupy EU! Come on netizens! EDIT: After careful consideration of the hard work done by everyone at all of the European Union's many, many institutions, and to avoid any of the other many, many satellite institutions (including things like ECHELON at RAF Menwith Hill) from misunderstanding the purpose of this post through the slightly misleading, and quickly construed graphic, I've updated it to convey the correct message. What was the point of this post? Well, it's a blog, isn't it? What is the point of all blogs? It's just a channel to vent and spread information. In this case, it's the former.